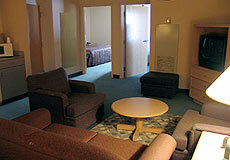 The Eureka Casino Hotel provides the excitement of Las Vegas and the values and environment of a small town. With 212 deluxe hotel rooms, a 30,000 square foot casino, two wonderful restaurants and 4,400 square feet of meeting space, and close proximity to some of the top championship golf courses in the U.S., and the Grand Canyon, the Eureka can offer convenience, service, excitement and fun to guests and groups of all persuasions. Mesquite is one of Nevada's top golf destinations and Eureka offers stay and play packages for individuals and groups that provide both value and diversity for any level of golfer. 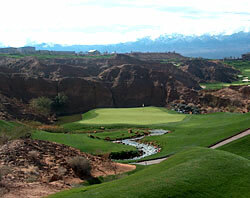 Eureka provides golf on the following courses: Wolf Creek, Oasis, Vistas, Casablanca, Palms, Falcon Ridge, Coral Canyon, Entrada, Green Springs, Sunbrook, Southgate, Dixie Red Hills, St. George Golf Club and Sky Mountain. Eureka offers over 200 modern spacious rooms, all featuring air conditioning, cable TV, hair dryer, iron & ironing board, computer data access port and interior access door. 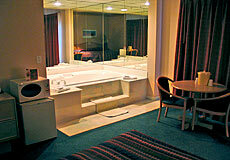 Rejuvenate yourself in one of the luxurious Jacuzzi Spa Suites featuring an oversized Roman Jacuzzi tub. Two-bedroom suites give families and business travelers a suite that includes two bedrooms and an adjoining living area. Eureka is located centrally to some of the most beautiful old western countryside in the United States. The Eureka's 30,000 sq. 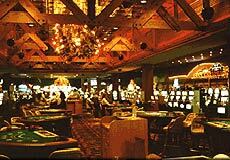 ft. Casino gives visitors Las Vegas style live gaming action including Blackjack, Craps, Roulette and Pai Gow Poker. Over 700 slot machines are found at the Eureka, such as Megabucks, Quartermainia and Wheel of Fortune, as well as the new generation of slot machines - video reels. The Eureka also features a 3,500 sq. foot Bingo Room. Guests and visitors to Eureka enjoy fine dining at Gregory's Steaks and Spirits - Mesquite's newest and finest steakhouse serving an enormous array of fine wines. The Tumbleweed Cafe and Buffet offers 24-hour dining specializing in delicious breakfast, lunch and dinner selections. Sunday Brunch is a special event at the Tumbleweed Cafe. For your meeting or reception needs, the Eureka offers 4,400 square feet of meeting space. 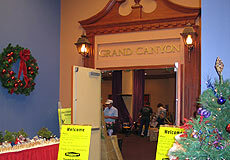 The Grand Canyon Room can seat 300 people theatre-style or 250 banquet-style. Catering is available upon request for buffet style banquet or plated dinner functions. 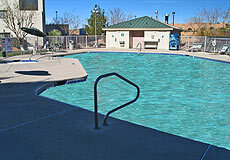 Travel North on Interstate 15 to the second Mesquite exit (Exit 122). Travel North (left) to Mesa Blvd. (approx. 1 block). 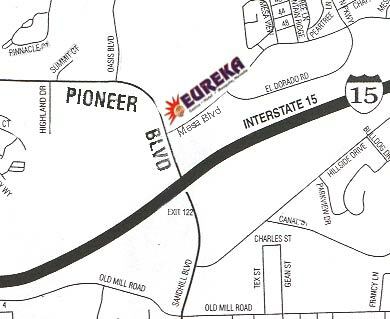 Turn right on Mesa Blvd and left into the Eureka parking lot.